Pickles are probably one of my least favorite condiments. I'm no kosher fan. And especially not a fan of those giant dill pickles they sell at Disneyland that somehow attract people when it's hot out... Never mind a soggy pickle that comes on the side of your sandwich either. 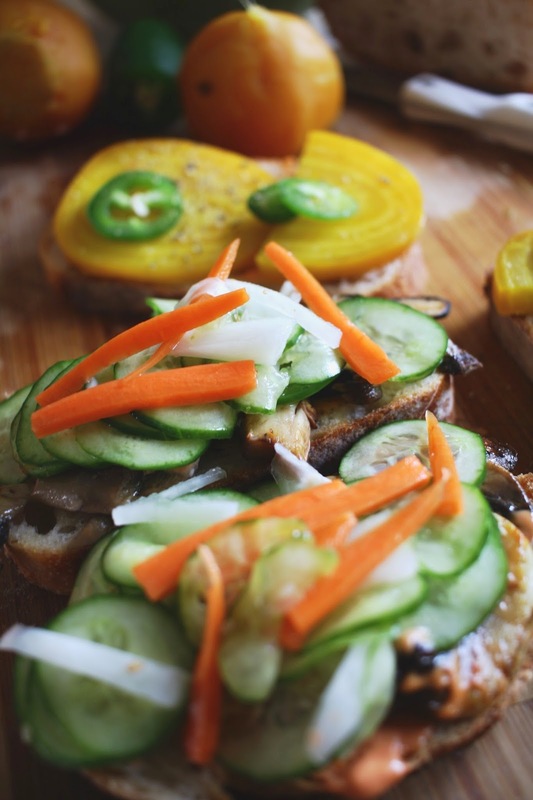 But sweet pickles however - the kind that are still crunchy and buttery and go on your banh mi - now those are my kind of pickle. I'm sure most cookbooks will tell you to obsessively prepare your jar by boiling it clean for pickling and measuring out your vinegar and sugar to the tee. 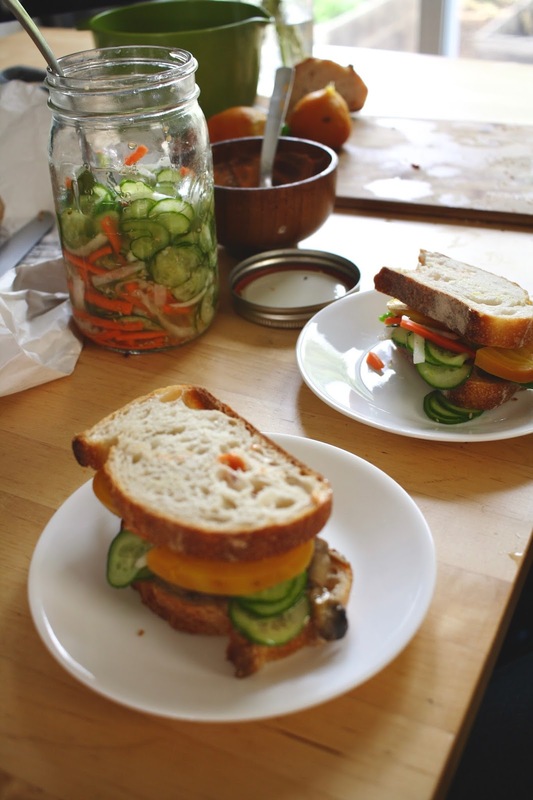 But the pickles I grew up with - the ones my mom and grandma made - are simple, crunchy, and ready instantly. 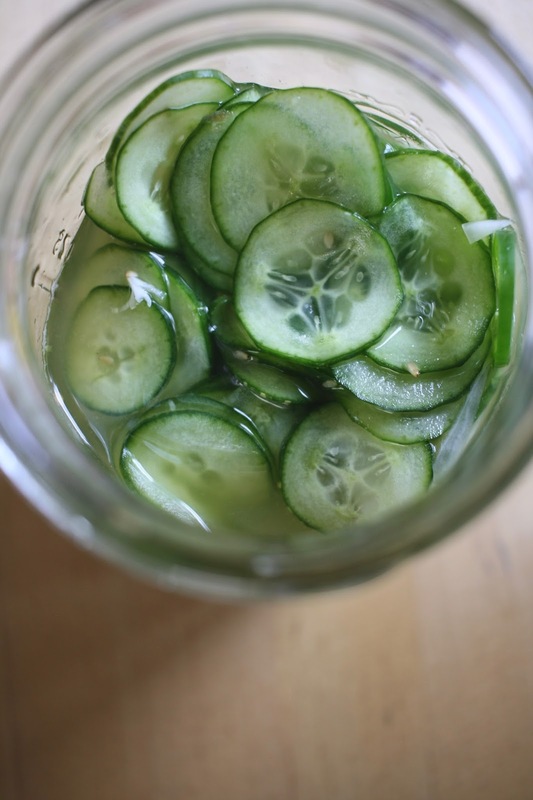 All you need is cucumber, vinegar, sugar, and sesame seeds. Slice cucumber, carrots, and daikon thinly and pat dry with paper towel. In your jar, combine vinegar, sugar, sesame seeds, and a few cranks of pepper, put on the lid, and shake till the sugar is dissolved. 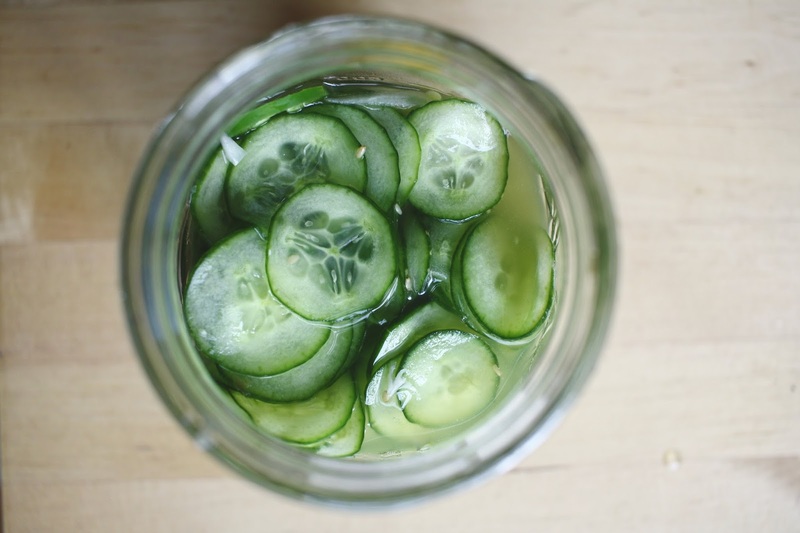 Be sure to taste the pickling liquid to see if it's too sour or sweet, and add more vinegar or sugar if needed. 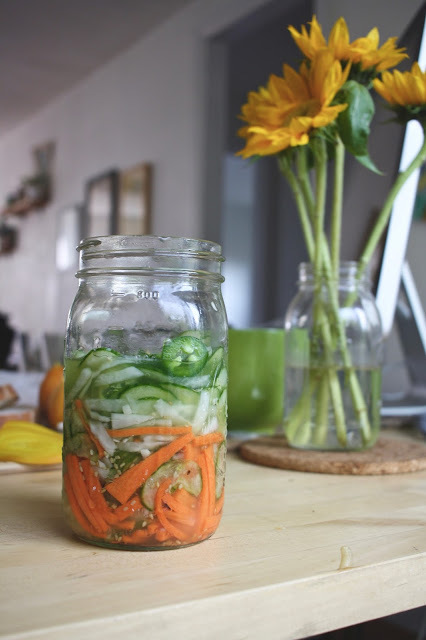 Then add the veggies to the jar and stuff till submerged in vinegar. It doesn't need to be floating in liquid, just enough so all the veggies are touching the pickling liquid so it'll absorb the flavor. 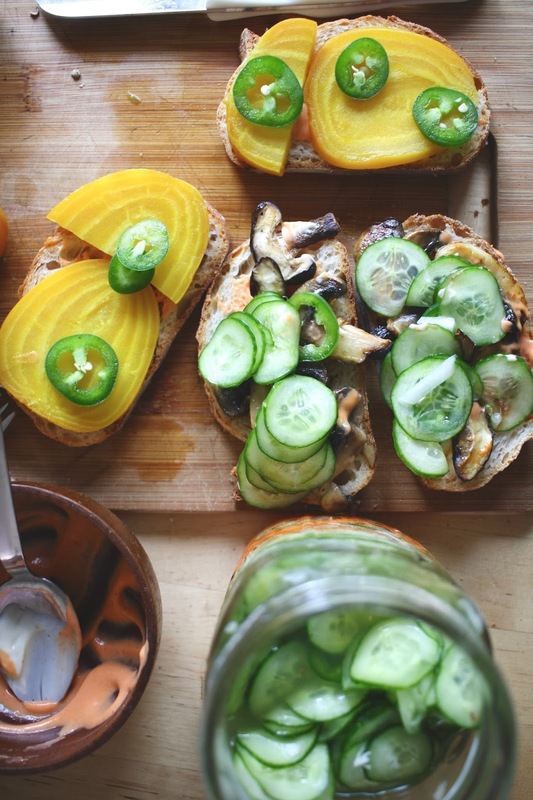 Place the pickles in the fridge while you cook your other components (see below) for at least 30 minutes. 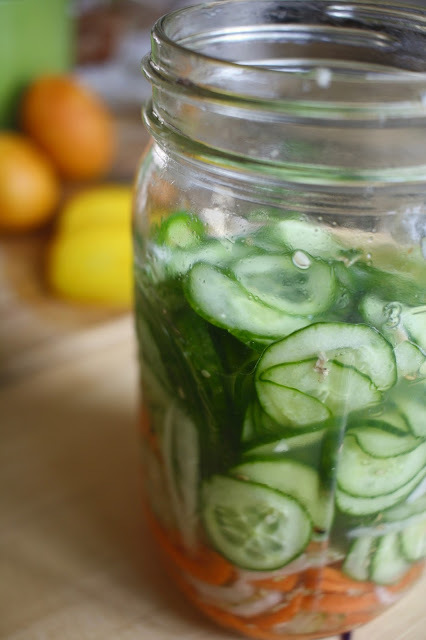 Pickles should last for a few weeks in the fridge with a seal, but if you make em right, they won't need to last that long! * Be sure to taste your daikon before you add it in. Sometimes it can be bitter and ruin the flavor of other veggies. You want it to be crunchy and mild to absorb the sweet vinegar flavor. 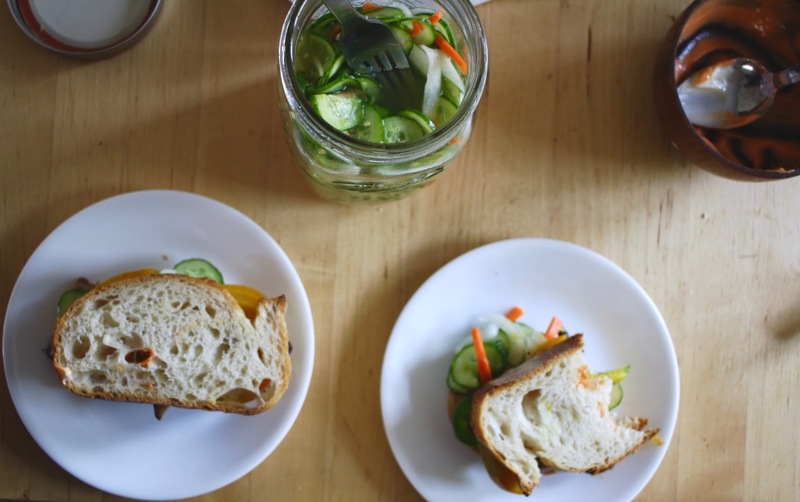 What to eat with your quick pickles, now that's up to you! My go to? Banh mi sandwiches. They add that perfect crunchy sweetness without distracting too much from the spicy sriracha mayo or sautéd mushrooms. During the summer I like to throw in beets for a non-traditional flair, and you can't forget jalapeño, carrot, and cilantro too. 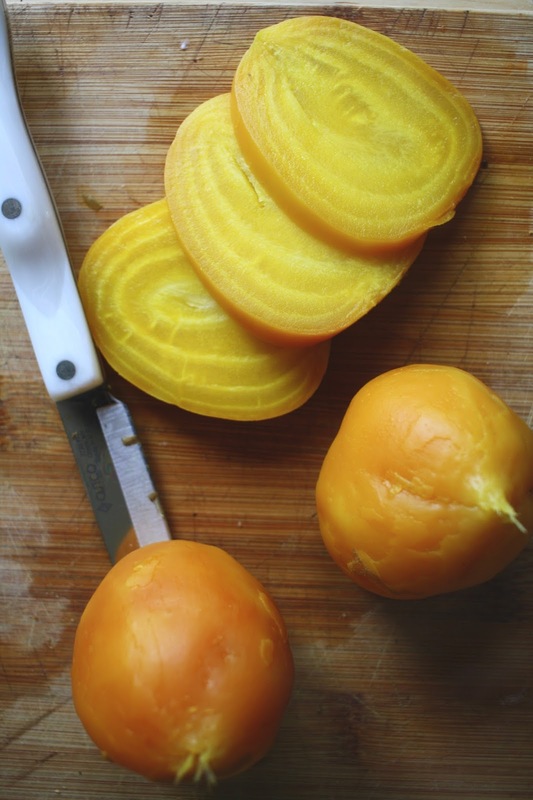 Cut the tops off your beets and boil submerged in water until tender, about 20 min. You'll know they're done when you can stick a fork in and it comes out cleanly. Drain water, then under the sink water, peel off skins with your fingers till clean. Slice mushrooms thinly lengthwise and sauté in a pan on medium with a dash of olive oil and few drops of sesame oil till cooked and starting to brown, about 5 min. 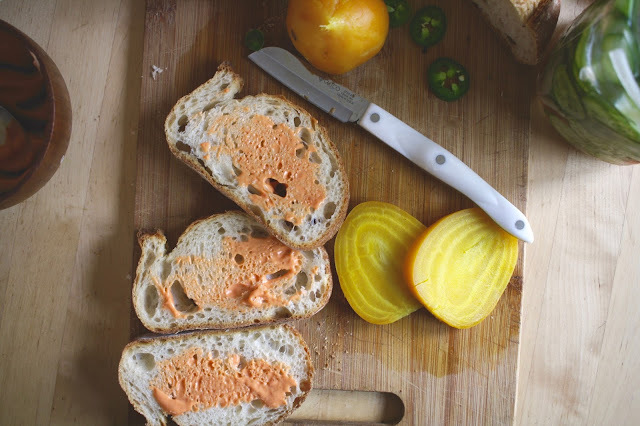 Mix sriracha and mayo, and spread on your bread. Then top with mushrooms, quick pickle, beets, jalapeño slices, and cilantro. Put the other slice on top and take a bite!